DARPA’s Terahertz Monolithic Integrated Circuit (TMIC) is the first solid-state amplifier demonstrating gain above 1 THz (1012 GHz). This achievement, recognized by Guinness World Records, could open up new areas of research and unforeseen applications in the sub-millimeter-wave spectrum and bring unprecedented performance to circuits operating in more conventional bands. 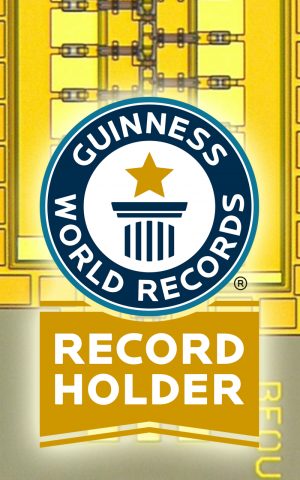 Officials from Guinness World Records today recognized DARPA's Terahertz Electronics program for creating the fastest solid-state amplifier integrated circuit ever measured. The ten-stage common-source amplifier operates at a speed of one terahertz (1012 GHz), or one trillion cycles per second—150 billion cycles faster than the existing world record of 850 gigahertz set in 2012. "Terahertz circuits promise to open up new areas of research and unforeseen applications in the sub-millimeter-wave spectrum, in addition to bringing unprecedented performance to circuits operating at more conventional frequencies," said Dev Palmer, DARPA program manager. "This breakthrough could lead to revolutionary technologies such as high-resolution security imaging systems, improved collision-avoidance radar, communications networks with many times the capacity of current systems and spectrometers that could detect potentially dangerous chemicals and explosives with much greater sensitivity." "Gains of six decibels or more start to move this research from the laboratory bench to practical applications—nine decibels of gain is unheard of at terahertz frequencies" said Palmer. "This opens up new possibilities for building terahertz radio circuits." For years, researchers have been looking to exploit the tremendously high-frequency band beginning above 300 gigahertz where the wavelengths are less than one millimeter. The terahertz level has proven to be somewhat elusive though due to a lack of effective means to generate, detect, process and radiate the necessary high-frequency signals. Current electronics using solid-state technologies have largely been unable to access the sub-millimeter band of the electromagnetic spectrum due to insufficient transistor performance. To address the "terahertz gap," engineers have traditionally used frequency conversion—converting alternating current at one frequency to alternating current at another frequency—to multiply circuit operating frequencies up from millimeter-wave frequencies. This approach, however, restricts the output power of electrical devices and adversely affects signal-to-noise ratio. Frequency conversion also increases device size, weight and power supply requirements. DARPA has made a series of strategic investments in terahertz electronics through its HiFIVE, SWIFT and TFAST programs. Each program built on the successes of the previous one, providing the foundational research necessary for frequencies to reach the terahertz threshold. What they've actually managed to create is a light amplifier. Because technically speaking, infrared starts where microwaves end. Terahertz waves are heat radiation. The article says one terahertz is 10^12 GHz, but they meant to say one terahertz is 1000 GHz or 10^12 Hz. Yes, but you miss the point and the importance of it. Above radio frequencies starts the optical domain where you can begin to focus and guide your signals with lenses, mirrors, and transmit them along glass fibers. That's the main practical distinction between radio waves and light. Direct amplification and modulation of a signal at 20 THz for example would mean that you can use the full data bandwidth of a common near-IR laser beam as found in cheap CD players in stereos. Even at just 1 bit per symbol, that's a bandwidth of 10 Terabits per second. Eikka wrote, "Above radio frequencies starts the optical domain where you can begin to focus and guide your signals with lenses, mirrors, and transmit them along glass fibers. That's the main practical distinction between radio waves and light." Never heard of radio frequency wave guides, huh? Or reflectivity in radio bands? The 'practical distinction' you're talking about is entirely a matter of materials. Optical bands interact with specific materials in specific ways. Radio bands interact with specific materials in specific ways. It's all photons; varying the frequency varies which materials a photon will interact with, and how. You can reflect radio waves, guide them, focus them... you just need to pick materials with the right properties to interact at those frequencies. So did this use the "vacuum" technology described in the other article? Sounds like even though that tech uses something like a vacuum tube it is still MEMS so still solid state to a certain extent...? Somehow the simple fact that this is DARPA doesn't convince me that this is a good thing.